Update, 11:30 a.m. Saturday: A gross necropsy found that Blondie's cause of death "was consistent with aspiration pneumonia," the Iditarod Trail Committee said in a statement Saturday. "Further testing is being conducted to complete the necropsy study," the statement said. A 5-year-old sled dog from Iditarod musher Katherine Keith's team died Thursday, race officials said. It was the first dog death in this year's Iditarod Trail Sled Dog Race. Keith had dropped the male dog, named Blondie, in Koyuk, a village that serves as an Iditarod checkpoint at mile 827 of the 1,000-mile race. 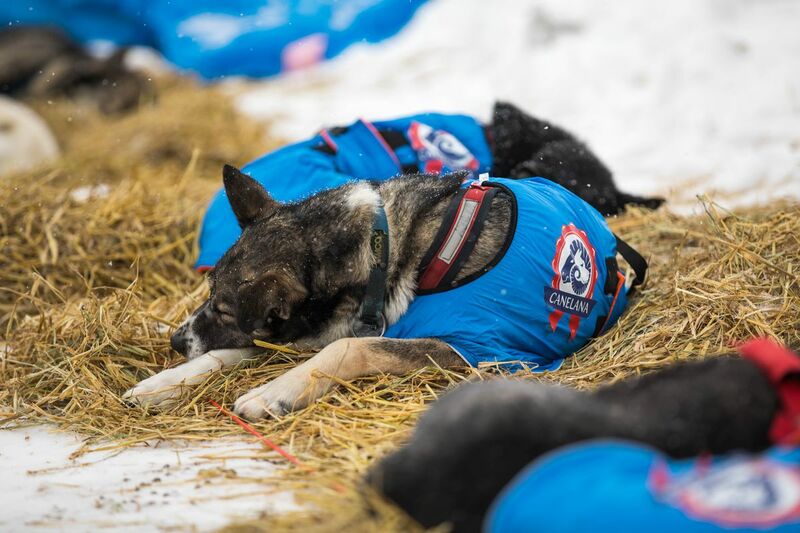 The dog was being treated for signs of pneumonia, according to a statement from the Iditarod Trail Committee, the nonprofit that stages the race. A race spokeswoman did not have information Thursday as to why Keith decided to drop the dog. Keith arrived in Koyuk at 7:04 p.m. Tuesday with a nine-dog team. She left the village at 4:15 a.m. Wednesday with eight dogs, having left Blondie behind, according to information on the Iditarod website. They continued down the trail. Blondie died around 12:15 a.m. Thursday, race officials said. He was indoors and under veterinary care, according to Stuart Nelson, chief veterinarian for the Iditarod. Blondie was one of 41 dogs waiting to be flown out of the Koyuk checkpoint, but bad weather prevented pilots from safely landing, Nelson said in a written statement. "However, (Blondie) was listed as the No. 1 priority for departure," Nelson said. Dogs left behind by mushers at checkpoints (which the race calls "dropped dogs") are typically cared for by veterinarians who volunteer for the duty. Then the dogs are flown out, often to Anchorage, where mushers' friends, family members or dog handlers pick them up and take them home. At their own expense, mushers can also designate somewhere else they'd like the dogs flown. John Baker, the 2011 Iditarod winner and Keith's fiance, said Thursday that Blondie had run the Iditarod twice before and was Keith's favorite dog. The two were "very, very close," Baker said. "I don't know anything at all about the incident other than the dog is gone," Baker said. By early Thursday, Keith and her eight-dog team had made it to White Mountain, the last major checkpoint of the race, 77 miles from the finish line and where all mushers must take an eight-hour break. Keith and eight dogs left the village at 9:34 a.m. Thursday, headed for Nome. Early Wednesday, Norwegian musher Joar Leifseth Ulsom and his sled dogs were the first team to cross the Nome finish line, winning the 2018 Iditarod. Keith, who lives in Kotzebue, is competing in her fifth Iditarod this year. She placed 19th last year. Last year's Iditarod had the highest number of dog deaths since 2009. During the 2017 race, three dogs collapsed on the trail and died, including a dog on Keith's team named Flash, a 4-year-old male. An autopsy found Flash died from acute aspiration pneumonia. A fourth dog died in 2017 after overheating on an airplane that the Iditarod chartered to fly dropped dogs from Galena to Anchorage. A fifth dropped dog, this one from Baker's team, died after it was flown back to Anchorage and picked up by a dog handler. It escaped from the handler's home and was hit and killed by a vehicle in the city. Correction: This story has been updated to correct the name of the dog from Blonde — the name provided by race officials — to Blondie.